Your website’s navigation and search features play an important role in determining the user experience. Better user experience means happier customers and improved conversion rate. You might want to make it really easy to find products that they are looking for on your site. 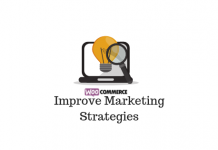 The default search and navigation options of WooCommerce will do its job in a general sense. However, when you want to personalize every bit of your customer experience, you may want to try more options. One option would be to customize WooCommerce product search so that customers feel more at ease with your site navigation. 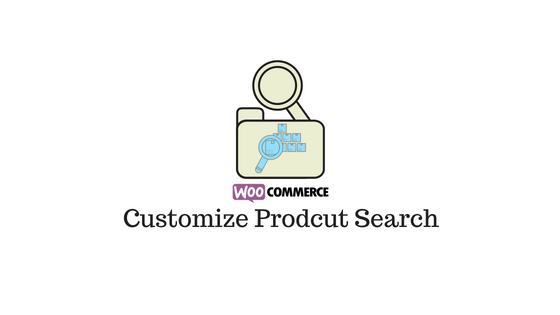 This article follows tips, tricks and tools that will help you customize WooCommerce product search on your store. How to WooCommerce Customize Product Search? Before you get into the process of personalizing the product search and navigation on your store, you need to understand the requirements. You need to carefully analyze your customer demographics and their search patterns and general interests beforehand. Your WooCommerce store should feature intuitive filtering options that would help customers find the relevant products. One of the important aspects for this is to keep simplicity in naming categories and attributes. Let’s look in more detail about these aspects to understand actionable strategies. Having a keen understanding of your customer base, the collective interests and the common lingo are important for a successful search strategy. You need to plan and test the search options thoroughly before going live. Similarly, in naming and describing your products, keep alive a customer perspective. Think more in terms of how your product would provide a experience a customer is looking for. For example, while describing a product, make more effort to describe more about what a customer is looking for in that product. Instead, if you are paying more attention to describe the technical prowess of a product, you might lose a major section of your audience. Similarly, your categories and attributes should have customer-friendly names. If these aspects are described using industry jargon, you may not really able to create a customer friendly search option. Lot of customers would want to directly type what they are searching in a search box. For this, you have to keep a search option in a visibly noticeable fashion. Once they find the search bar, users should be able to quickly enter the keyword and get the results. This process should be made as simple and intuitive as possible. Because, this is often a direct way of finding products on your store. And mostly users who are using this option know what they are looking for. As they are not casually browsing your store, there will be better chances for conversion too. Make sure you keep your search option in a color scheme different than the rest of your store. When customers search for products on your store, they might be looking at combinations of several features and attributes. It is important that your search option is able to help them find the product they are looking for with minimum hassles. Having a wide range of customer centric filtering options is really key here. Customers would often want to filter search items more than the basic options such as color, make, size, etc. Many would prefer filtering based on brands, popular categories, new stock, sale items, products with offers, etc. Based on the structure of your store, you have to offer all the relevant filtering options for customers to find the right product. You cannot assume one standard filtering strategy would work for all your products. Depending on the product, you may have to offer a few combinations of filters. You have to decide this based on a thorough analysis of the interests of your customer base. Moreover, the positioning of product filters should also be tested on your live site. Sometimes, a simple position change can make customers take notice and use it more often. There are more chances of conversion when a customer is looking for a specific product on your site. Such customers are more likely to enter a long tail keyword on your search field. Semantic product search is the answer for such a search. This is a territory of artificial intelligence, as your store should be able to sort results based on the combination of words used by the customer. For example, a search for big screen smartphone, should be able to display results of smartphones that are over a certain screen size. If you are not really comfortable to customize your site by altering code, your best bet is to find a suitable extension. Here is a list of extensions that you can use to customize product searches on your store. When you have a large number of products on your store, it might be a little tough for your users to find the ones they are looking for. An advanced search option that would offer multiple options for users to filter their search would do the trick here. This WooCommerce extension does exactly that. Users can search with specific product categories or features (global attributes) to get to the ones they are searching for. 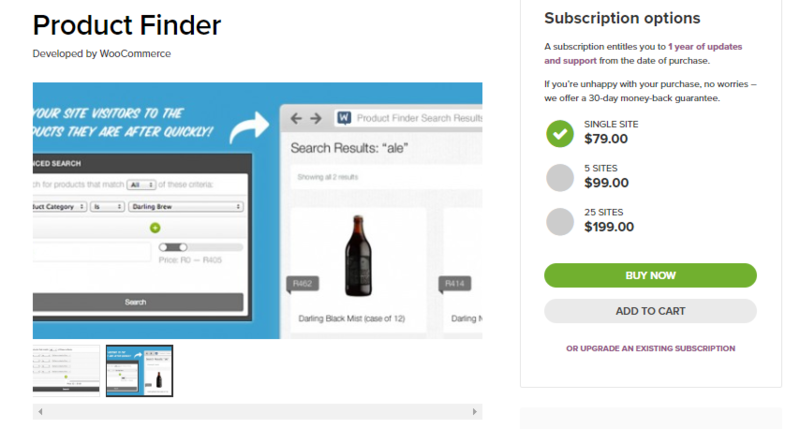 The price slider offers an option to search for products that fit their budget. Basically, your customers can use a combination of these search options to arrive at the best results. With the help of this extension, you can set up an advanced product finder next to your product list to help make searches more relevant. Adding the product finder to your website too is an easy process. You can use different options like template tag or shortcode to set up the product finder. It also offers an option to add the finder as a widget, which is the easiest option. You can provide an optional title for the search and specify the criteria of the search. When you are using the template tag or shortcode option, you need to specify the parameters for the search. If parameters are not specified, the product finder will be based on the options featured on the settings panel. You can also use an Action Hook to set up Product finder on your site. However, you should have good coding knowledge to attempt this. You can buy the extension at a price starting from $79 for a single site subscription. 5-site subscription is $99 and you can get the 25-site one for $199. 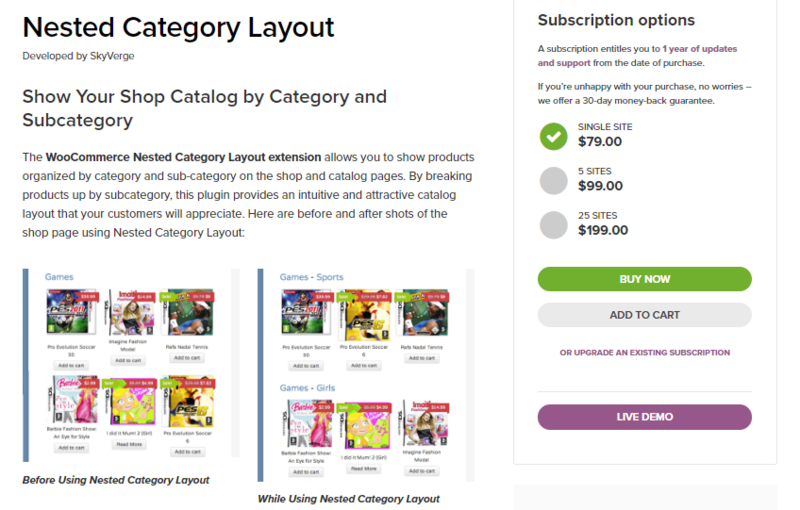 This extension helps you organize your shop page based on category and sub category. As a result, your customers can access products falling under specific categories more readily. This would naturally enhance the user experience on your store, and should possibly impact conversions too. To see more products from a particular category, users can simply click the category name. The extension allows you to choose which all categories you want to be part of the nested layout. You can display categories in the default WooCommerce format too. You can customize your shop page layout where your products are nested under categories and subcategories. The intuitive layout offered by this extension would surely help in improving the customer satisfaction and sales on your store. You can easily adjust the number of products you want to display under a particular sub category. And if you have products that don’t fall under any category, they will be shown before the nested display. Similarly, if a product does not fall under any subcategory, it will be shown before the list of sub category. The framework of this extension is quite flexible, and allows customization. You can purchase a single site subscription of this plugin for $79. The 5-site subscription comes at $99, and the 25-site subscription will cost you $199. With live search and great insights into your search patterns, this extension helps you super charge the search feature on your store. Overall, the ease of finding a product on your store would help your customers appreciate your store. And, subsequently, conversions too will increase on your store. The live search facility provides a preview of the product with images and pricing information as they type. Customers can add the product to cart directly from the search preview itself. The extension also has live filters which will help to display the right products when customers search with different parameters. Customers may search with product attributes, categories, tags, or price range; and the extension ensures relevant results. 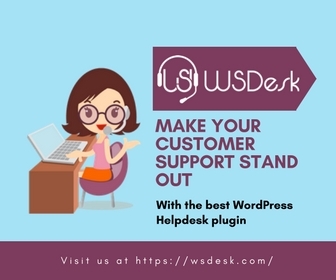 This extension enhances your product search option to help improve customer experience along with helping you gain valuable insights. 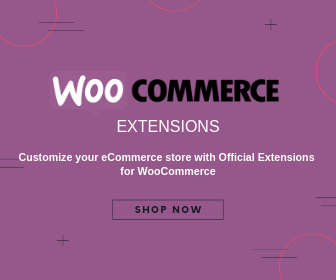 The extension integrates seamlessly with popular WooCommerce themes, including Storefront child themes. Another marked advantage of this extension is that it provides valuable insights related to the search behavior on your store. This will help you devise marketing activities that are better targeted. You can compare real time and historic search activity and understand any gaps in your search feature. It also helps you understand which products are most searched for in your store. Based on this, you can optimize your promotional strategies to improve conversions too. The extension provides automated integration, which makes searches easy on both front end as well as back end. And, the extension ensures all the newly updated products are indexed promptly. Product and category thumbnails help to make the whole search experience more visually appealing. Moreover, the concept of search weights make searches more relevant on your store. You can add product filter widgets of your choice with the help of the built-in assistant of the extension. You can choose the advanced product search option to replace the default WooCommerce search option. At the same time, you can choose to display it as a widget on the sidebar. In fact, the entire page will get updated as and when customer types a relevant keyword, or price range. You will find all live search options as short codes. In addition, you can add the advanced search option on any page. This essentially helps you create specialized shop pages on your store. The extension would cost your $49 for a single site subscription. The 5-site and 25-site subscriptions are available at $99 and $149 respectively. When you sell products of different brands, it is important to allow customers to search based on brands. This WooCommerce extension allows you to create different brands on your store, and add details like description and image. You can then assign products to the brands you create, which will listed on a page with the help of a short code. 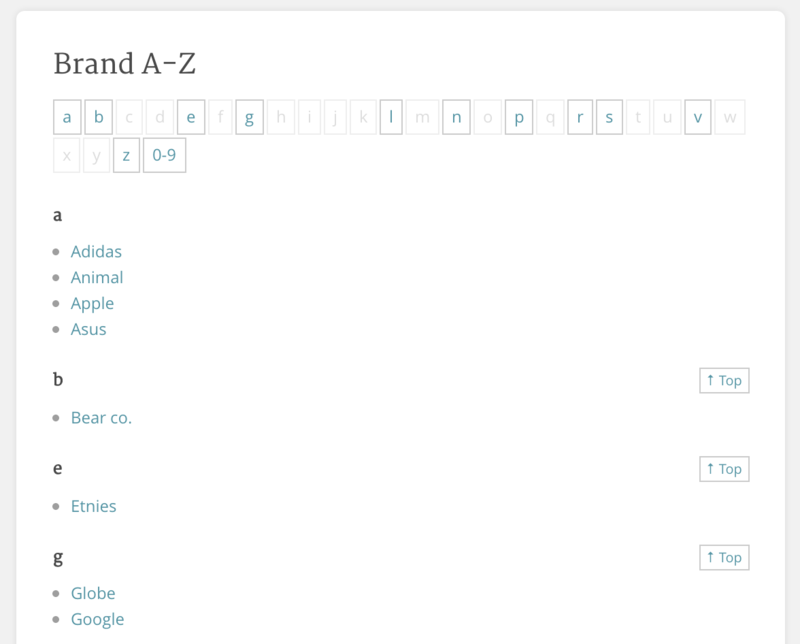 Also, you can display thumbnails of each brands on a dedicated page. Your customers can use brands option to view products in a layered layout. Adding brands to your store is another way of customizing product search options on your WooCommerce store. 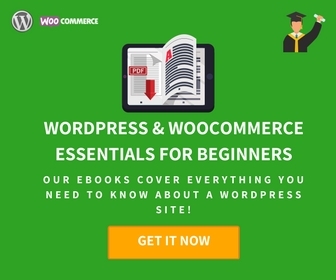 The extension can prove to be quite handy, when you are selling products of multiple brands on your WooCommerce store. A single site subscription of this extension would cost you $29. 5-site subscription is available for $49 and 25-site subscription for $99. When your store has a lot of variable products with different attributes, it is important for users to switch between each. As it is enabled with Ajax, instant reloads will help users to switch between variations easily. In addition, the extension also offers a range of interactive elements for navigation. Overall, it makes navigation on your site especially pleasant, and helps increase conversion rate as well. Single site subscription of this extension would cost you $49. 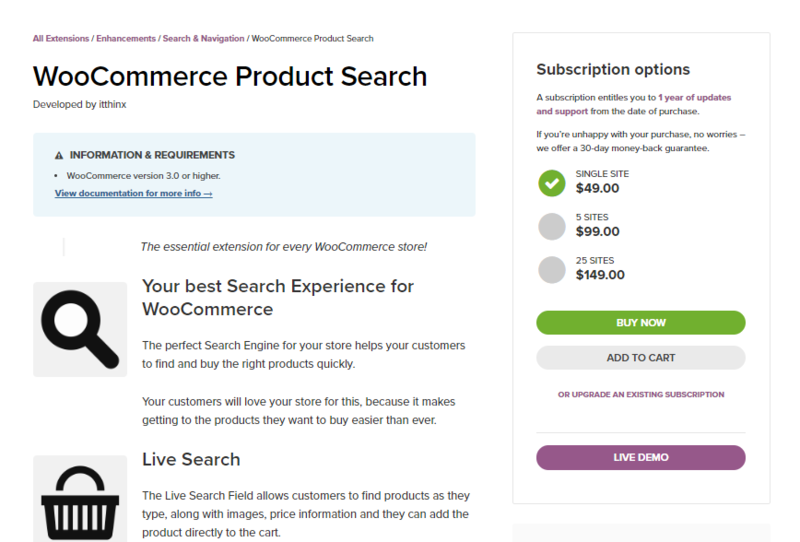 WooCommerce offers a basic search facility in built with it. However, this is not really enough when you scale your store to a bigger extent. You might want to offer better options for your customers to search and navigate on your store. We hope this article has provided you with some actionable tools to customize your product search and navigation. If you are using any of the extensions mentioned in the article, let us know how you find working with it.